What do we have in this chapter 1 part 6? Connectionless communication behaves differently than connection-oriented communication, so the method for sending and receiving data is substantially different. First we'll discuss the receiver (or server, if you prefer) because the connectionless receiver requires little change when compared with the connection-oriented servers. After that we'll look at the sender. In IP, connectionless communication is accomplished through UDP/IP. UDP doesn't guarantee reliable data transmission and is capable of sending data to multiple destinations and receiving it from multiple sources. For example, if a client sends data to a server, the data is transmitted immediately regardless of whether the server is ready to receive it. If the server receives data from the client, it doesn't acknowledge the receipt. Data is transmitted using datagrams, which are discrete message packets. 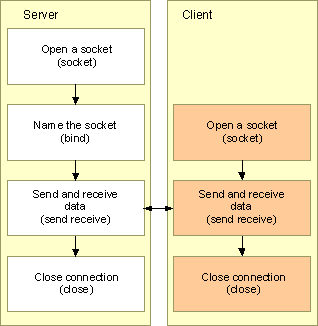 The following Figure shows a simplified UDP communication flow between server and client. The difference is the use of WSABUF structures for receiving the data. You can supply one or more WSABUF buffers to WSARecvFrom() with dwBufferCount indicating this. By supplying multiple buffers, scatter-gather I/O is possible. The total number of bytes read is returned in lpNumberOfBytesRecvd. 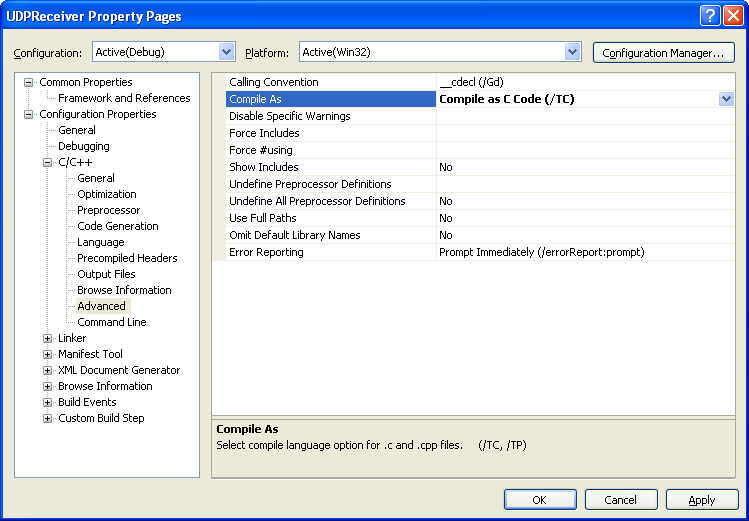 When you call WSARecvFrom(), the lpFlags parameter can be 0 for no options, MSG_OOB, MSG_PEEK, or MSG_PARTIAL. These flags can be bitwise OR together. If MSG_PARTIAL is specified when the function is called, the provider knows to return data even if only a partial message has been received. Upon return, the flag MSG_PARTIAL is set if only a partial message was received. Upon return, WSARecvFrom() will store the address of the sending machine in the lpFrom parameter (a pointer to a SOCKADDR structure). Again, lpFromLen points to the size of the SOCKADDR structure, except that in this function it is a pointer to a DWORD. The last two parameters, lpOverlapped and lpCompletionRoutine, are used for overlapped I/O. Another method of receiving (and sending) data on a connectionless socket is to establish a connection. This might seem strange, but it's not quite what it sounds like. Once a connectionless socket is created, you can call connect() or WSAConnect() with the SOCKADDR parameter set to the address of the remote machine to communicate with. No actual connection is made, however. The socket address passed into a connect() function is associated with the socket so recv() and WSARecv() can be used instead of recvfrom() or WSARecvFrom() because the data's origin is known. The capability to connect a datagram socket is handy if you intend to communicate with only one endpoint at a time in your application. 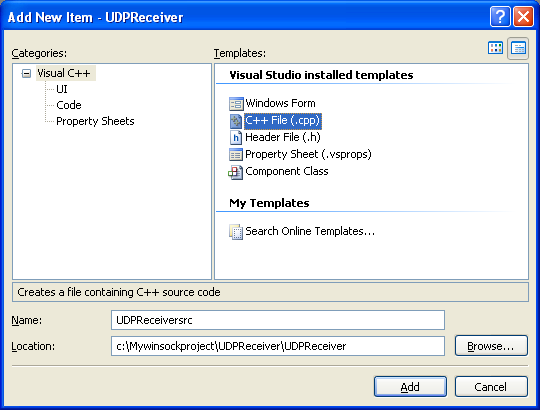 The following code sample demonstrates how to construct a simple UDP receiver application. 4. In the Application page, select Empty project for the Additional options: Leave others as given and click Finish. 7. 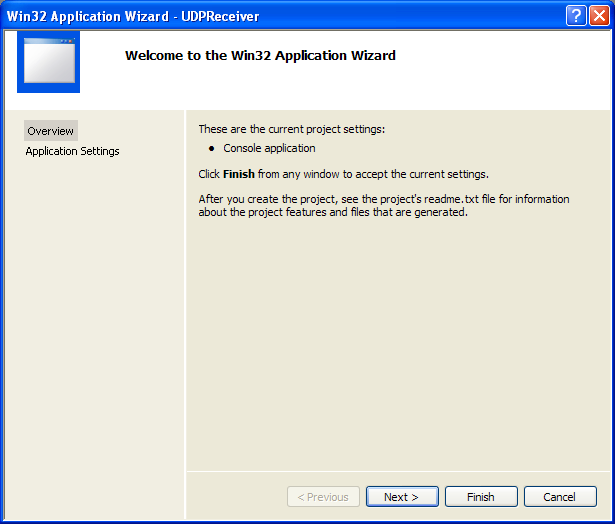 Before we can build this Winsock C Win32 console application project, we need to set the project to be compiled as C code and link to ws2_32.lib, the Winsock2 library. Invoke the project property page. 8. 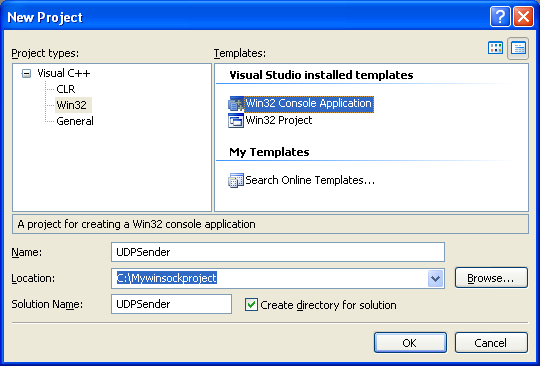 Expand the Configuration folder > Expand the C/C++ sub folder. 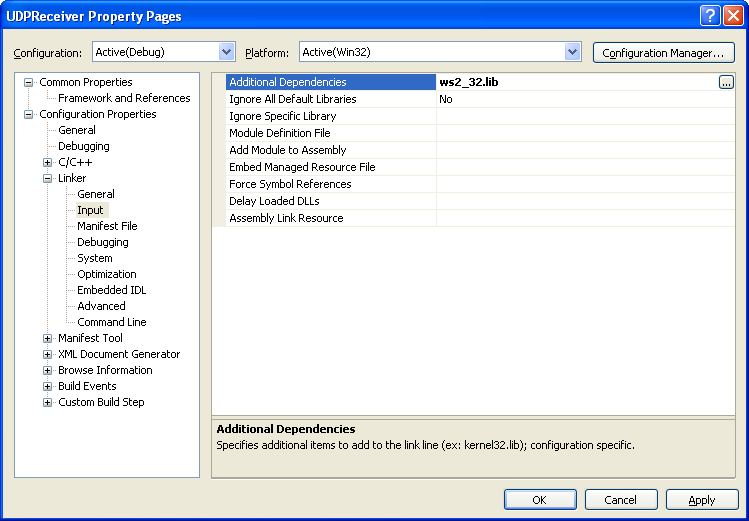 Select the Advanced link and for the Compile As option, select Compile as C Code (/TC). 9. 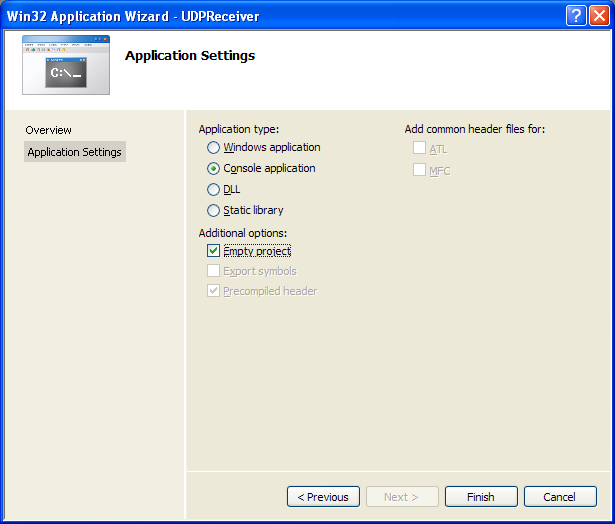 Next, expand the Linker folder and select the Input link. For the Additional Dependencies option, click the ellipses at the end of the empty field on the right side. 10. Manually, type the library name and click OK or you can just directly type the library name in the empty field on the right of the Additional Dependencies. Click OK.
11. Now, add the source code as given below. 12. Build the project and make sure there is no error which can be seen (if any) in the Output window normally docked at the bottom of the IDE by default. 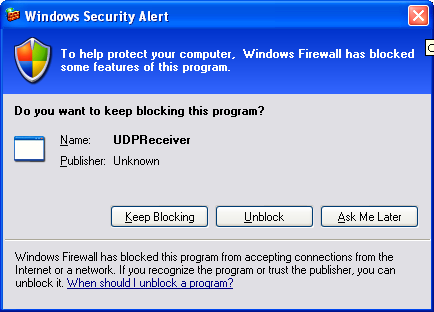 Run the project and unblock the Windows firewall if any. 13. If there is no error, a sample output is shown below. 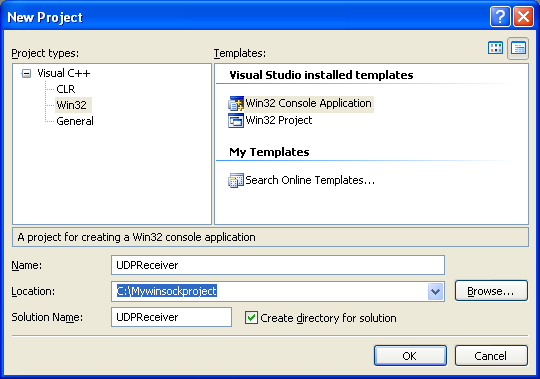 The UDP receiver is ready to receive data, unreliably. Now that you understand how to construct a receiver that can receive a datagram, we will describe how to construct a sender. Again, WSASendTo() is similar to its ancestor. This function takes a pointer to one or more WSABUF structures with data to send to the recipient as the lpBuffers parameter, with dwBufferCount indicating how many structures are present. You can send multiple WSABUF structures to enable scatter-gather I/O. Before returning, WSASendTo() sets the fourth parameter, lpNumberOfBytesSent, to the number of bytes actually sent to the receiver. The lpTo parameter is a SOCKADDR structure for the given protocol, with the recipient's address. The iToLen parameter is the length of the SOCKADDR structure. The last two parameters, lpOverlapped and lpCompletionRoutine, are used for overlapped I/O. As with receiving data, a connectionless socket can be connected to an endpoint address and data can be sent with send and WSASend(). Once this association is established, you cannot go back to using sendto or WSASendTo() with an address other than the address passed to one of the connect functions. If you attempt to send data to a different address, the call will fail with WSAEISCONN. The only way to disassociate the socket handle from that destination is to call connect() with the destination address of INADDR_ANY. 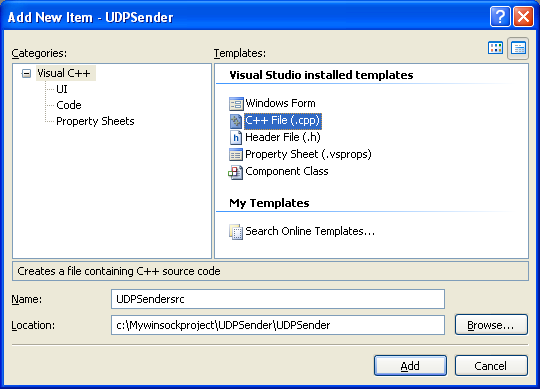 The following program example demonstrates how to construct a simple UDP sender application which can be used together with the previous UDP receiver program example. // for datagrams on port 5150. // Send a datagram to the receiver. 11. Manually, type the library name and click OK or you can just directly type the library name in the empty field on the right of the Additional Dependencies. Click OK.
12. Build the project and make sure there is no error which can be seen (if any) in the Output window normally docked at the bottom of the IDE by default. Run the project and if there is no error during the build and run stages, a sample output is shown below should be expected.